Caverton Helicopters has claimed ownership of the Chopper that crash landed in Kabba, Kogi State, while conveying Vice-President Yemi Osinbajo to a campaign rally in the State. This is just as the company said ‘unusual weather conditions’ may have been responsible for the incident. 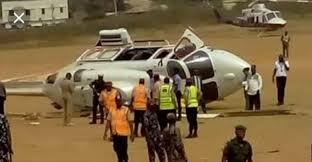 It was learnt that all the occupants of the chopper came out from the helicopter unhurt. A statement signed by Capt. Josiah Choms, Managing Director / Accountable Manager of the company, added that relevant authorities have been informed and would carry out investigations into the incident. “An Augusta AW139 Helicopter, under management by Caverton Helicopters was involved in a mishap on landing in Kabba, Kogi State around 3.pm today (2nd February 2019) as a result of unusual weather conditions. “The relevant authorities have been duly informed and an investigation into the incident has commenced. We will, of course, support the authorities as required. We wish to reassure the public and our various stakeholders of our unwavering commitment to safety in all of our operations”, he said.